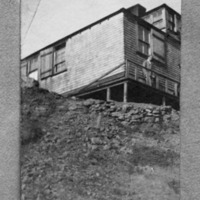 This 1904-06 photo shows the cabin designed by Burnham firm associate architect Willis Polk (1867-1924), on a high vantage point overlooking San Francisco. The person shown here on the deck appears to be Polk. For more information on Polk's career, which included several buildings in San Francisco for the Burnham firm to 1910, see the online Encyclopedia of San Francisco (http://www.sfhistoryencyclopedia.com). Bennett, Edward H. (Edward Herbert), 1874-1954 , “San Francisco office of Daniel Burnham's architectural firm, Twin Peaks,” Digital Collections - Lake Forest College, accessed April 26, 2019, http://collections.lakeforest.edu/items/show/2092.